Topics: Trees & Shrubs, Fruit, Conifers, and Hedging. It is written for ASP.NET language. 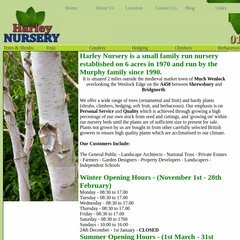 ns2.harleynursery.co.uk, ns110.fastdnsservers.com, and ns111.fastdnsservers.com are some of its 4 Nameservers. It is hosted by Netins Inc. Iowa, using Microsoft-IIS/6 web server. PING www. (216.51.232.110) 56(84) bytes of data. A ping speed test response, is timed at 20.6 ms.